I can tell you for sure, I'm so excited at the beginning of the strawberry season, but soooo much more when first cherries show up. I adore cherries, they're so contagious, like pop corn or chips ("Once you pop, you can't stop" thing). The thing that makes me super angry is the price, at least here in Italy. And I live in the area famous for production of cherries (Vignola, a town near Modena). There are huge cherry and amarena orchards and still, unlike with Balsamic vinegar and Parmigiano Reggiano, that you can find easily at convenient price going directly to the producers, cherries are sold at outrageous price of 7 to 9 euros per kilo. 1 kg wouldn't last 2 hours in my house, not to talk about all the beauties I'd like to bake with them. Mmmmmm, cherry pie (just saw Shane's blog, and licked my computer screen), cherry strudel, French cherry pie, I could really go on like this till tomorrow. But the picture that caught my attention several weeks ago, was nothing else but Cherry Tiramisù. Kept thinking about it day and night (well, almost) and wouldn't rest till I made it. Last weekend I bought half a kilo of cherries and mascarpone cheese, but missed one more ingredient, postponed everything till yesterday, bought cherries again and finally did it. Yes, I did it. I don't care about summer or bathing suit, or heat outside (35°C today), I made it and I ate it. I was in heaven. But now I'm back to give you the recipe. The recipe was published in Cucina Moderna magazine, and I'll give you the full recipe, but I tried to half it, because half of my cherries were gone again by the time I got to making the tiramisù. I said tried, because it's hard to half 5 egg yolks or 3 egg whites. Hmmm, weighing them, of course, but why throw half the egg? And that recipe called for sponge cake, which I substituted with Pavesini biscuits (kind of like lady fingers or Savoiardi, but smaller and very thin). I didn't have any sweet red wine, so I used fruit juice and Maraschino liquor. First, I washed and stoned the cherries, a few more disappeared in my mouth, of course. Then I put them in a small saucepan, and added enough fruit juice to cover them completely. If you want to use the wine, like recipe suggests, you should add 40 g of granulated sugar (take them out of those 220 g). Add cinnamon stick, grated orange rind and boil for 15 minutes. 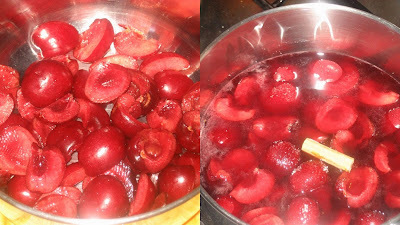 Drain the cherries / filter the juice (or wine). At this point I added the Maraschino to the juice. For the cream whip together the mascarpone, granulated sugar, and egg yolks till nice and creamy. Whisk the egg white(s) until firm, add powdered sugar and whipped cream, lemon juice and egg and mascarpone cream. Mix everything and assemble the tiramisù as you like. In one large glass pan or smaller dessert cups. I'm leaving the choice to you. I kind of made both. If you're using the sponge cake, as in recipe, cut it into stripes, place them on the bottom, moisten with wine/fruit juice. Or if you are using the lady fingers, dip them in the wine or juice first. Spread some cream over the biscuits, then put cherries, cover with cream again, another layer of biscuits, more cream. You know, the usual stuff. Before serving sprinkle with some ground cinnamon. Ovo je recept i sastojci koji sam uzela iz časopisa, a u zagradama su izmjene koje sam napravila, jer sam ga prepolovila i zbog nedostatka nekih sastojaka. Očistite trešnje i izvadite koštice. Stavite u manju posudu, stavite toliko vina ili soka da ih potpuno prekrijete, dodajte štapić vanilije i 40 g šećera, naribanu koricu naranče, pa kuhajte 15 minuta. Procijedite vino/sok i izvadite cimet. Za kremu, umutite mascarpone s ostatkom šećera i žumanjcima da dobijete gustu, glatku kremu. Posebno umutite bjeljanjke s mljevenim šećerom, dodajte tučeno slatko vrhnje, limunov sok i kremu od žumanjaka. Pomiješajte sve dobro u jednoličnu kremu. Namočite biskvit ili piškote u vinu/soku i stavite na dno posude (najbolje staklene zbog ljepšeg izgleda). Preko biskvita/piškota stavite malo kreme, potom rasporedite trešnje, pa opet kremu i još jedan red piškota i kreme (ako ste koristili biskvit imat ćete samo jedan sloj, i završiti s kremom). Po želji pospite s malo cimeta i ukrasite trešnjama. La ricetta viene dalla rivista Cucina Moderna, ma io l'ho cambiata un po' secondo i miei gusti e quello che avevo a disposizione, ma anche perché non volevo preparare la dose intera, visto che sono l'unica a mangiarlo. Ecco, quindi la ricetta completa con le mie dosi personali tra le parentesi(). Scegliete voi. Ho lavato e denocciolato le ciliegie. Le ho messe in una casseruola con del succo (tanto da ricoprirle completamente), scorza di arancia grattugiata e una stecca di cannella. Se usate il vino, come nella ricetta, aggiungete anche 40 g di zucchero semolato (da togliere da 220 g). 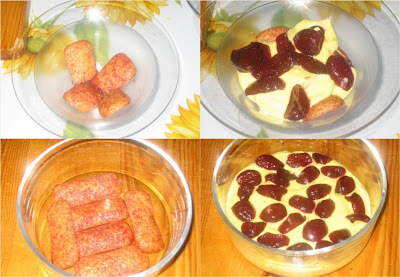 Ho fatto bollire le ciliegie nel succo per 15 minuti, poi ho filtrato il succo, tolto la cannella e ho aggiunto 2 cucchiaini di Maraschino (che non c'era nella ricetta). Poi ho mescolato il mascarpone con lo zucchero semolato e i tuorli fino a ottenere una crema. Ho montato a neve l'albume con lo zucchero a velo. Poi ho aggiunto la panna montata, il succo di limone e la crema di tuorli e mascarpone, e mescolato bene tutto. La ricetta diceva di tagliare il pan di Spagna a fettine e spennelarle con il vino delle ciliegie. Io invece, ho usato i miei Pavesini, che ho inzuppato nell succo e poi ho assemblato il tiramisù come al solito a stratti, alternando la crema, le ciliegie e i pavesini, finendo con la crema, spolverata con un po' di cannella, e decorata con le ciliegie fresce (che sono sparite subito dopo la foto). Con questa ricetta partecipo alla raccolta di FrancescaV - Tiramisù. Avete anche voi una ricetta non classica? Partecipate. Francesca vi aspetta. cherries are an interesting addition. very creative. Sorry, Bob, it's all gone. Next time. My uncle and aunt just ordered one when they come to visit. Ciao ! Che bello ! Ma leggendo il post ho capito che vivi in italia ! Pensavo scrivessi dagli USA !!! Anche io adoro le costose ciliege !! *Grazie, Pasquy, era molto buono, e a mia sorpresa, l'hanno voluto mangiare tutti. La prossima volta faccio la dose intera. *Sì, Natalia, vivo in Italia, a Modena. That looks so delicious! I've never made anything like this before but I would love to try it. I know my family would love it. Love your new layout! The ladybugs in your header are too cute! I know, everybody loves tiramisù, if you add fruit to it, it tastes more like summer dessert. that just looks awesome!!!!! the pic is too good. This looks absolutely divine!! I love that you don't care about bathing suit season - I am the same way! I'd rather eat! I know what you mean... Cherries = Heaven..Gosh this looks really delicious.. I really love the idea of cherries in this! How creative and tasty! Yum!